I love Texas. 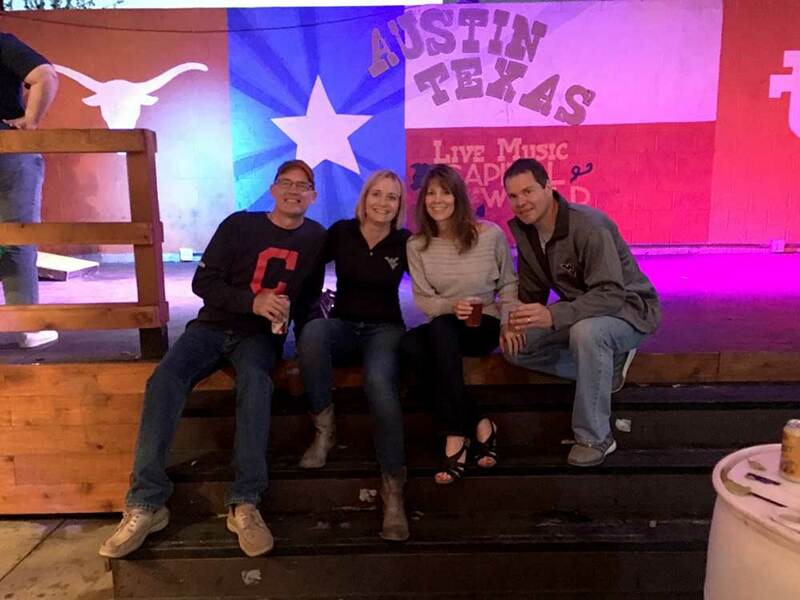 I love the people, the food, the music, and especially that Texas twang that’s like honey drizzled on biscuits. 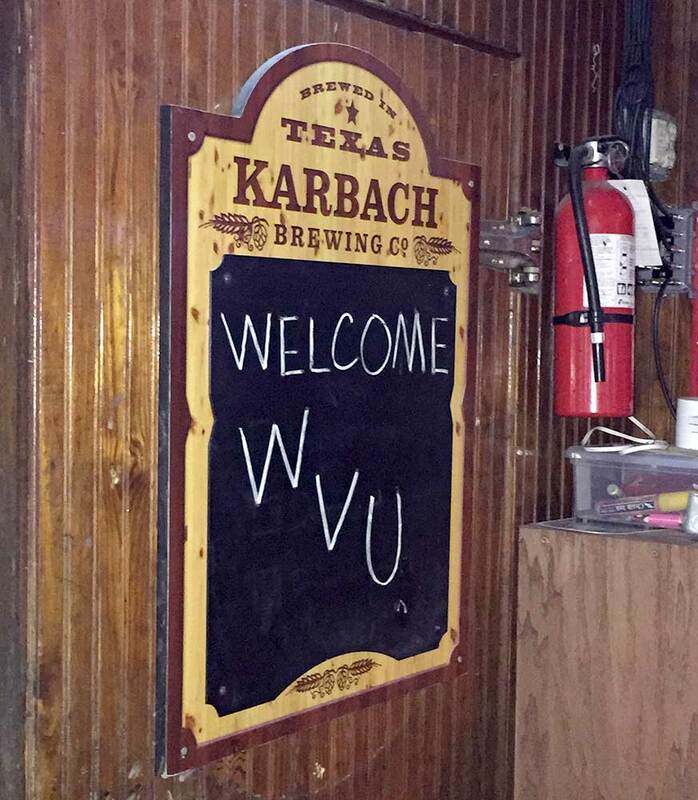 In a lot of ways, Texans are like the wonderful folks from my great home state of West Virginia. 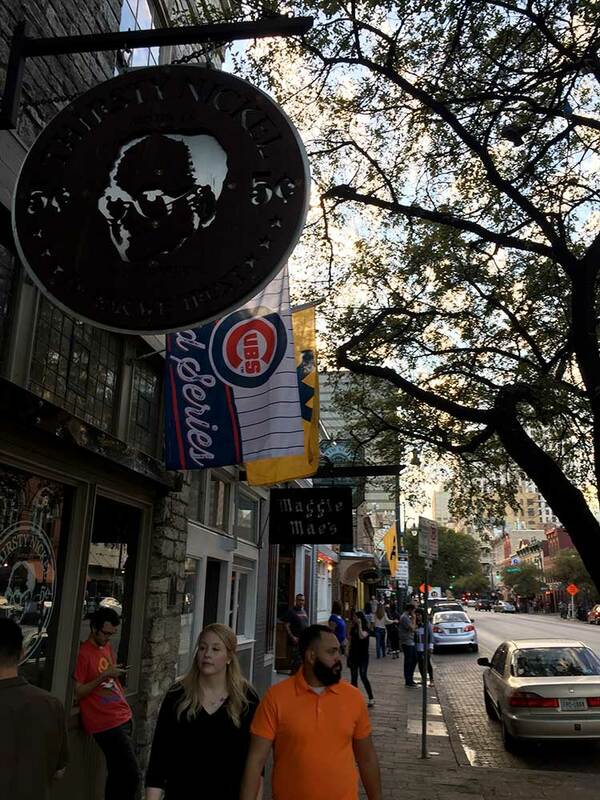 First, there’s that Texas pride. It’s hard for outsiders to understand this level of loyalty and pride – until they’ve experienced it firsthand. Like West Virginians, Texans also have a lot of grit, character and bigheartedness. They greet you with wide smiles and firm handshakes. I’ve never felt so welcome at an away game. My friend Maja Mullens agrees. She traveled to many games when we were still in the Big East, but this was her first away game since we joined the Big 12. This welcome wagon always starts days before the game. 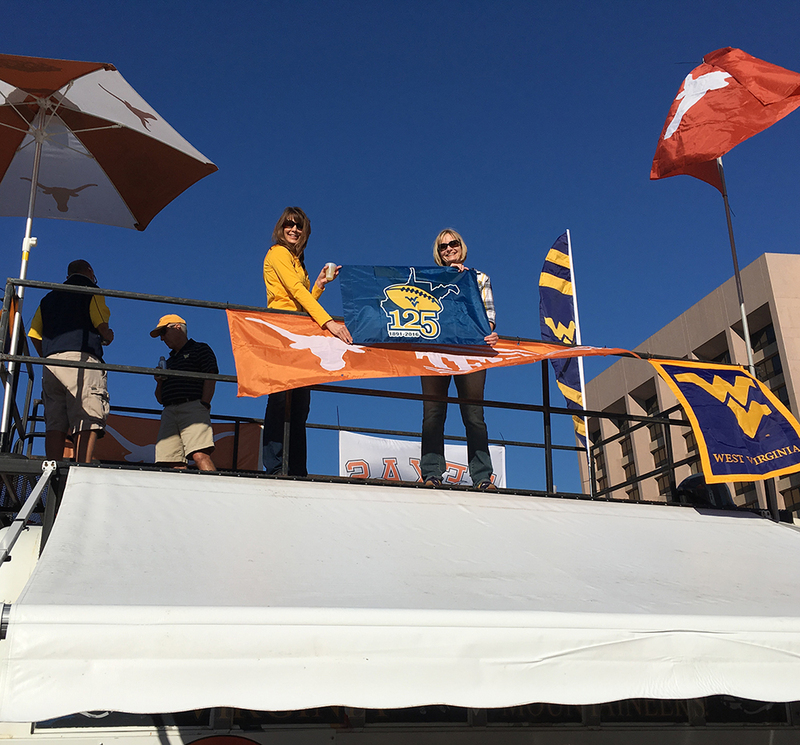 Flying WV flags wave cheerfully alongside Longhorn flags on East 6th Street. 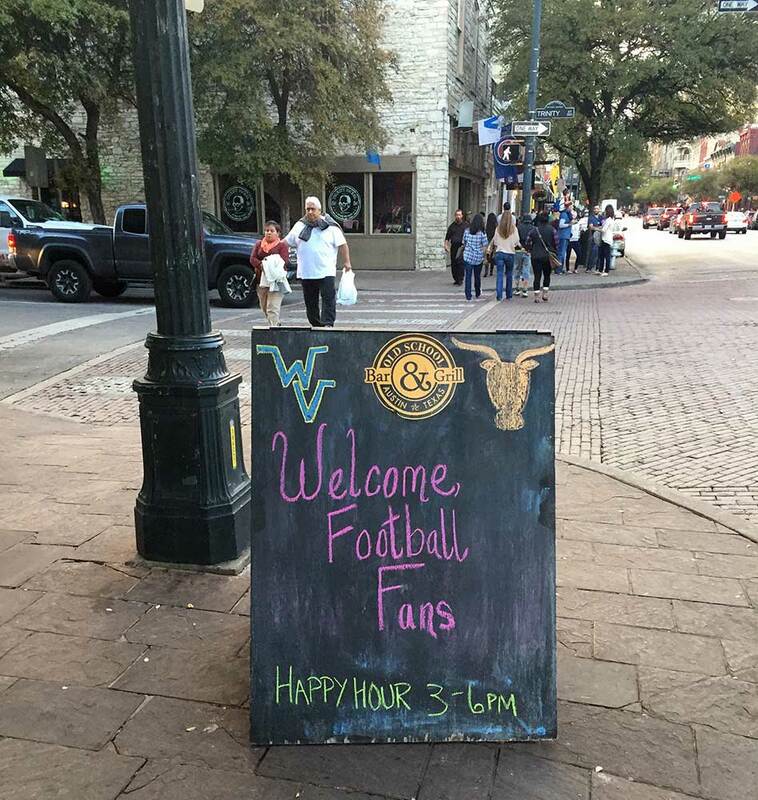 The bar owners even post welcoming messages inside and outside their establishments. 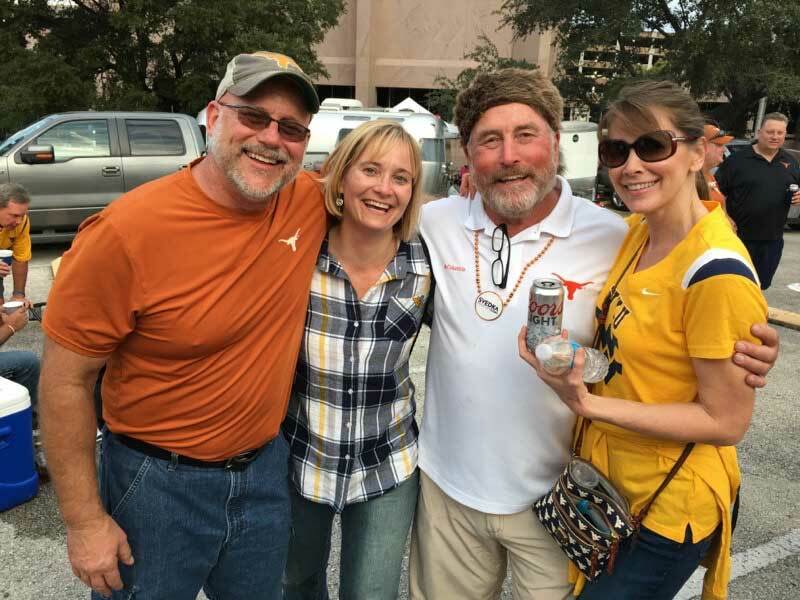 This was one of the first things that struck us when Dave and I went to Austin for the 2012 game, and now we go back every year we play Texas in the Darrell K. Royal Stadium. 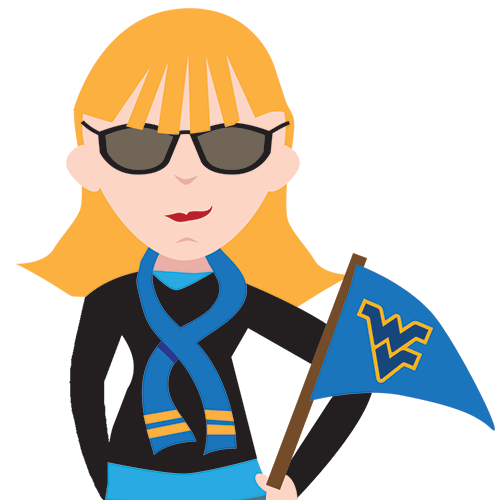 It makes me proud to know that this is how Mountaineer Nation makes opposing fans feel, too. When you know the origin of the word Texas, it makes sense. It comes from the Hasinai Indian word tejas, which means friends or allies. 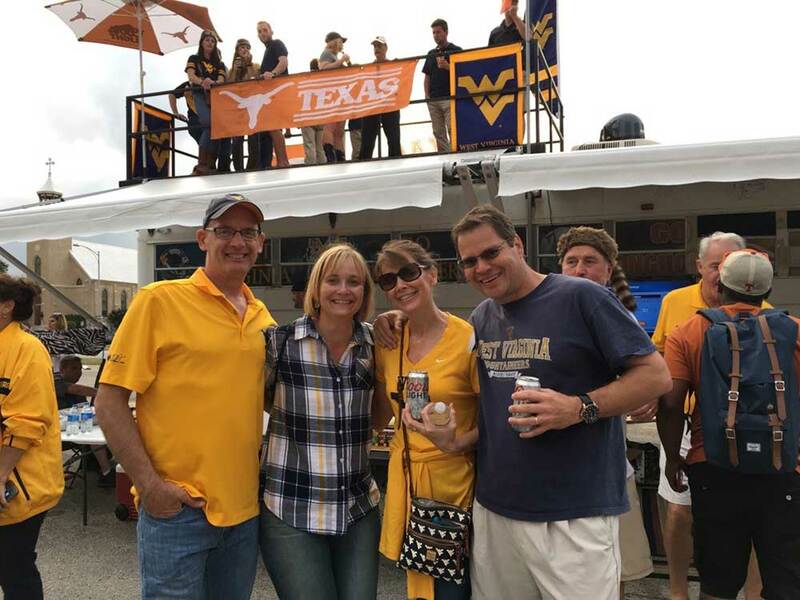 And like Mountaineer Nation, Longhorn fans are well known for their high energy and team spirit. 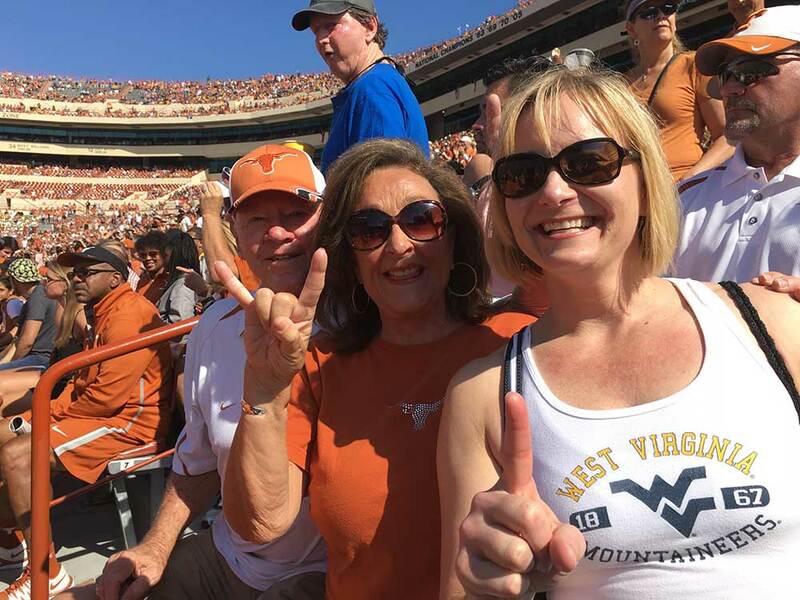 Football is a religion to Texas and West Virginia fans alike, with their place of worship inside a packed stadium. 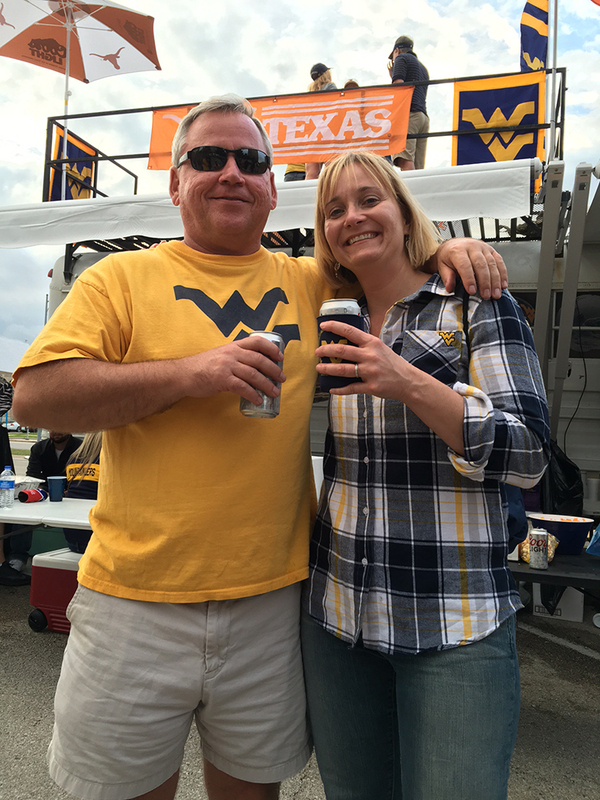 These fall Saturdays are all about fans getting together as one big, happy family and rooting for their team. 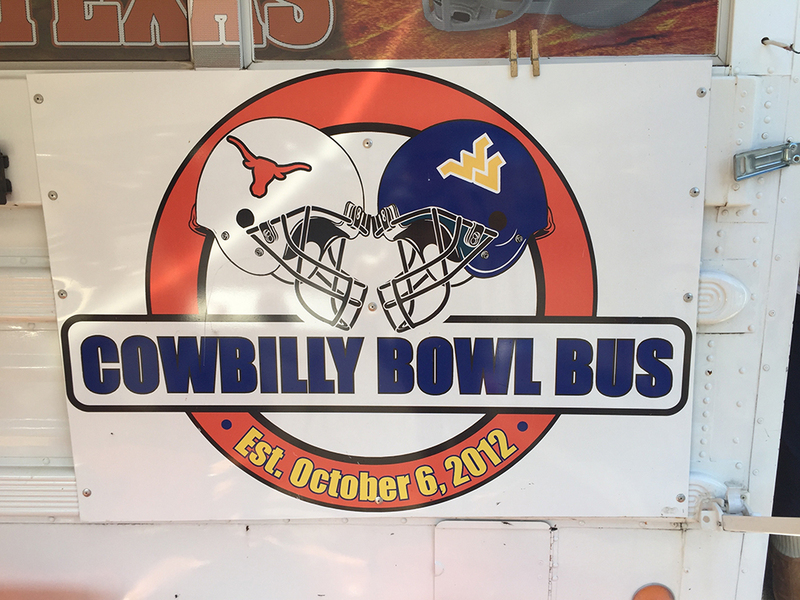 Now, let’s talk about the Cowbilly Bowl. 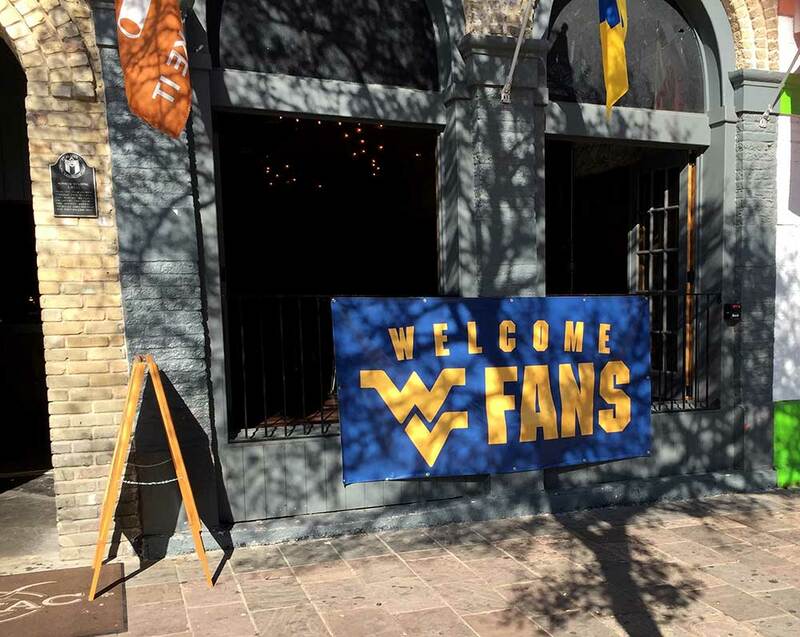 Last year, Dave and I met a group of West Virginia and Texas fans at Mario’s Fishbowl who had established the Cowbilly Bowl when we first joined the Big 12. 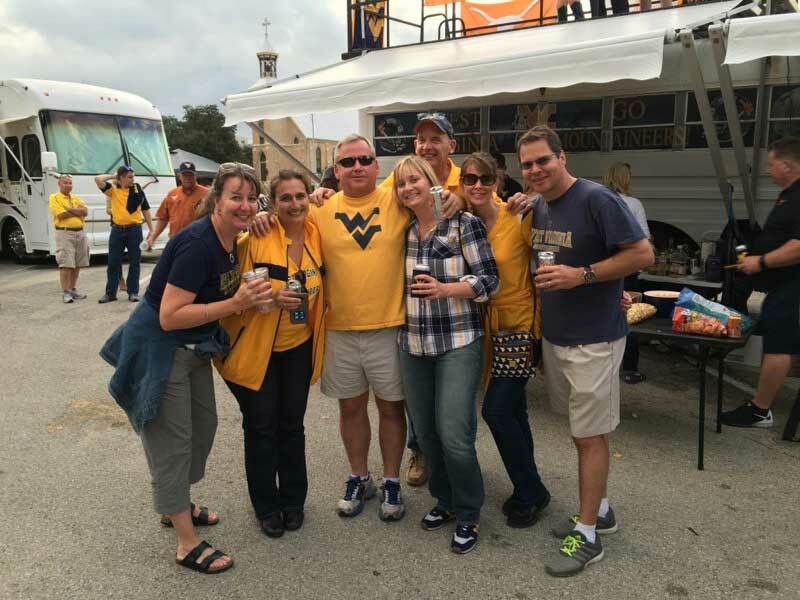 The contingent from West Virginia all grew up together in Parkersburg. However, the common thread between the West Virginians and Texans is FedEx. Several of the 18 members either currently work at FedEx or retired from FedEx. To make the Cowbilly Bowl official, they created a logo, which many sported on their shirts and jackets. Three of the guys even bought an old school bus they transformed into a rockin’ tailgating bus. Check it out. 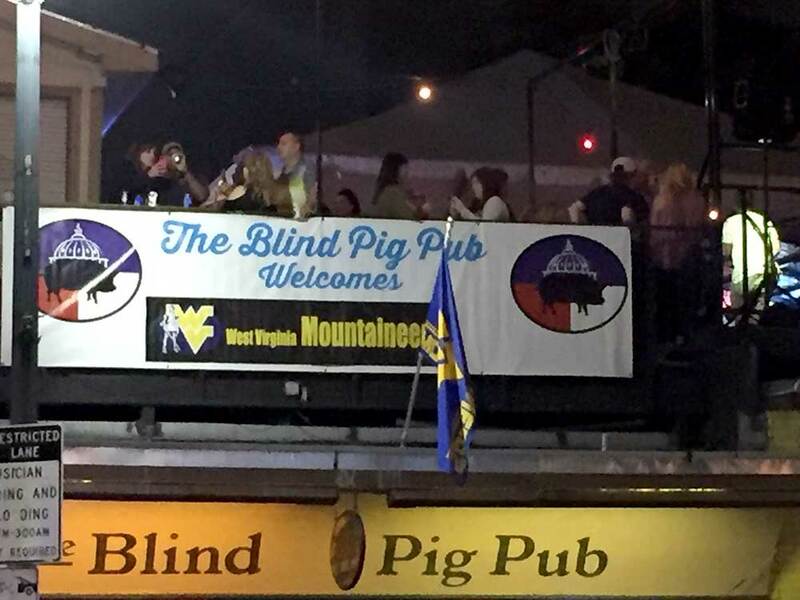 Dave and I ran into them Friday night at The Blind Pig on East 6th Street, which was the official WVU Alumni bar. 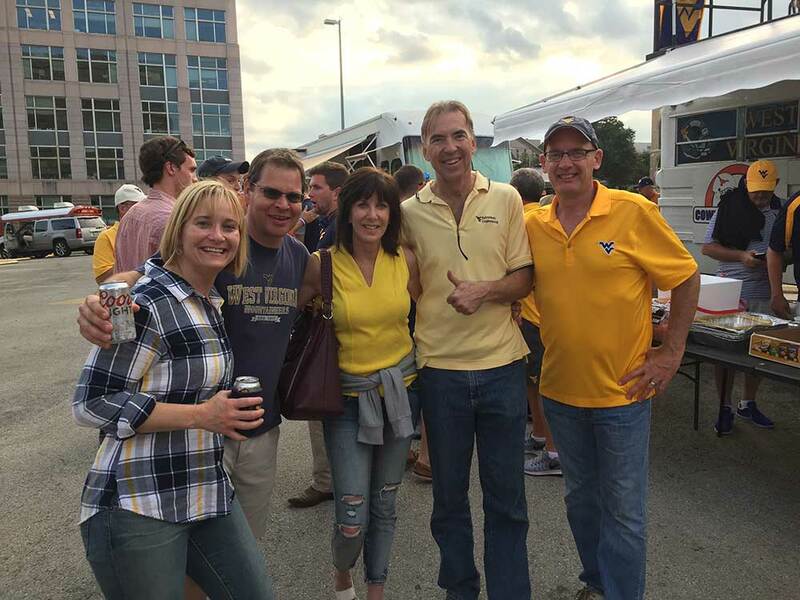 Since the alumni tailgate was sold out, we were just going to wing tailgating Saturday morning with our friends Steve and Jill. 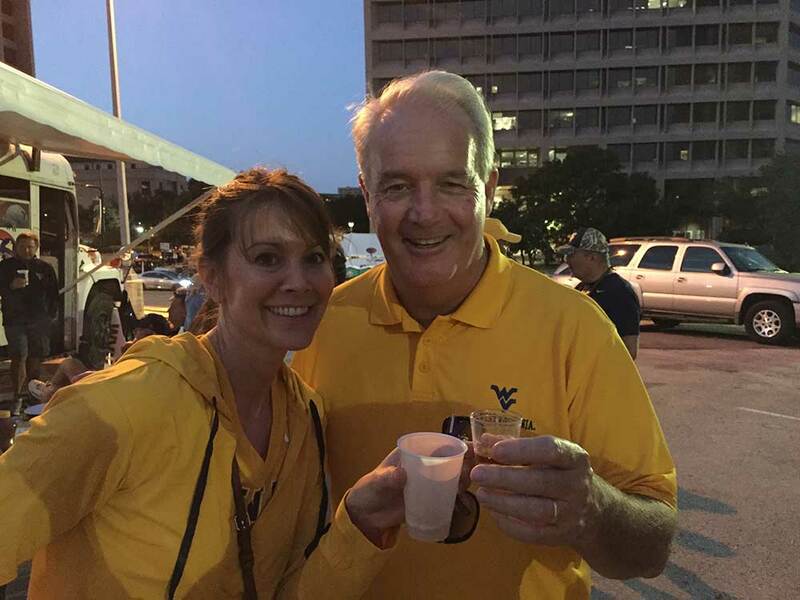 But then John Hushion, of Parkersburg, invited us to their tailgate. Boy howdy! Now that’s an invitation we eagerly accepted. 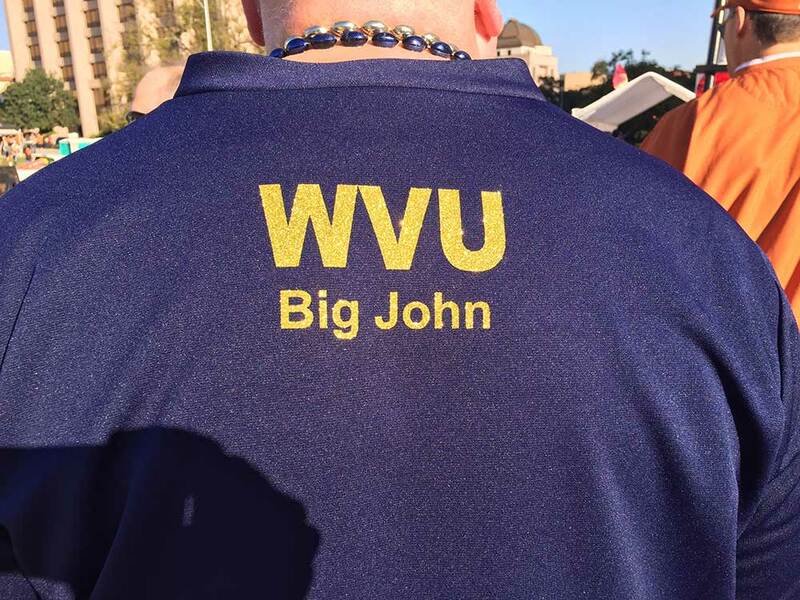 When we showed up in the morning, John introduced us to diehard Texas fan Big John, who was wearing a WVU cheerleading uniform. 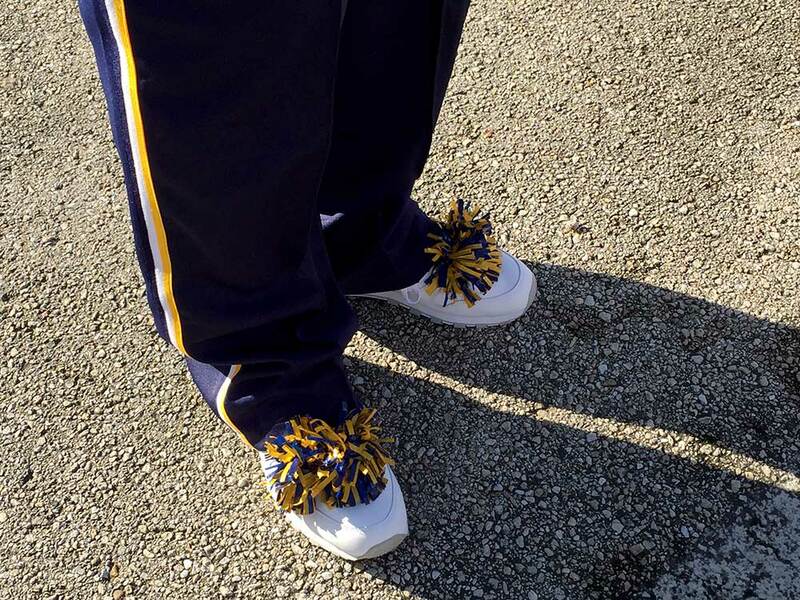 You see, it’s a Cowbilly Bowl tradition that someone from the losing team has to wear whatever the winning team designates as their tailgating and game attire for the following year. 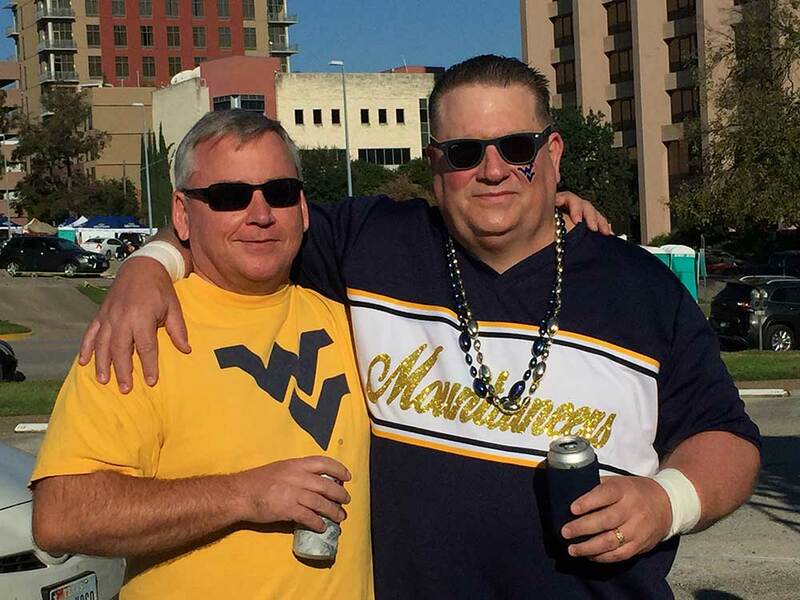 Last year, West Virginia fan Pat Reed had to wear a Longhorns football uniform. 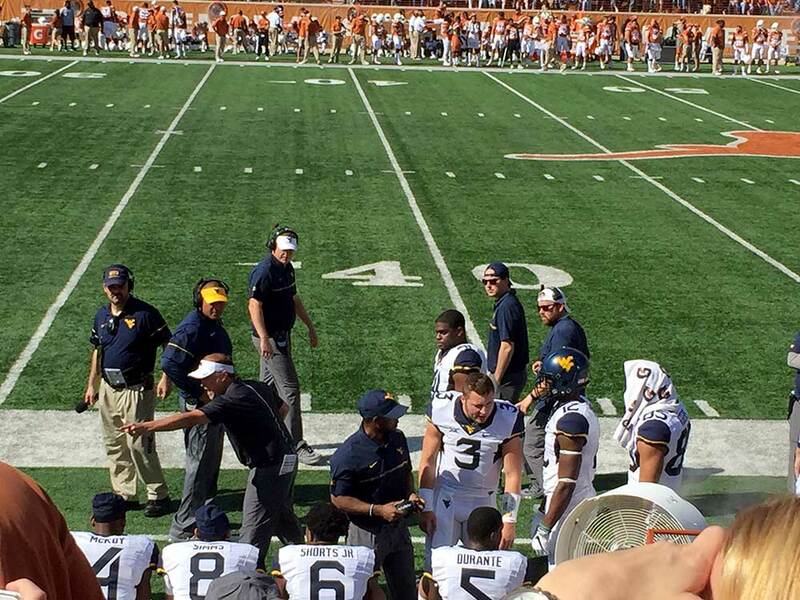 He actually got to go on Mountaineer field, where he high-fived all the Texas players. He then watched the game from his stadium seat – while wearing a Longhorns uniform. I can’t wait to see what Big John has to wear next year. After tailgating in the morning, Steve, Dave and I made our way to the stadium in search of tickets. As luck would have it, I hit the jackpot! As we got closer to the stadium, a man was holding up a single ticket. The ticket was his son’s who couldn’t make it. After that, Steve and Dave bought tickets for seats a couple sections over in row 62. Steve offered to swap tickets with me so I could sit with my husband. But I wasn’t about to give up my ticket. Don’t get me wrong. I love Dave bunches, but this was an opportunity I wasn’t going to miss out on. We made plans to meet at the Champions Club at half-time. At my seat, I enjoyed the hospitality of Jeff and Jane Rhodes. I had so much fun watching the game with them. 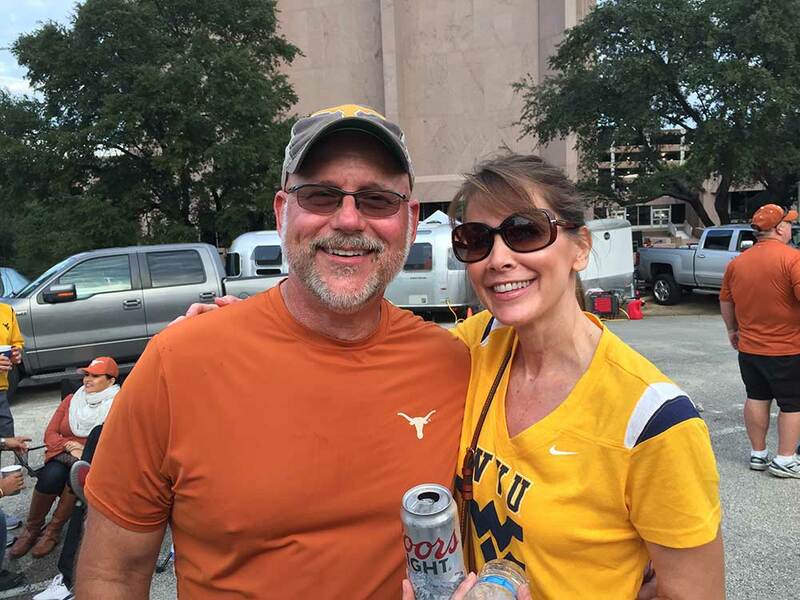 Jeff and Jane are just two more reasons I love Texans and Longhorn fans. I hope they come to Morgantown next year. In the 4th quarter, I joined Dave and Steve in their section to watch the nail-biting victory. 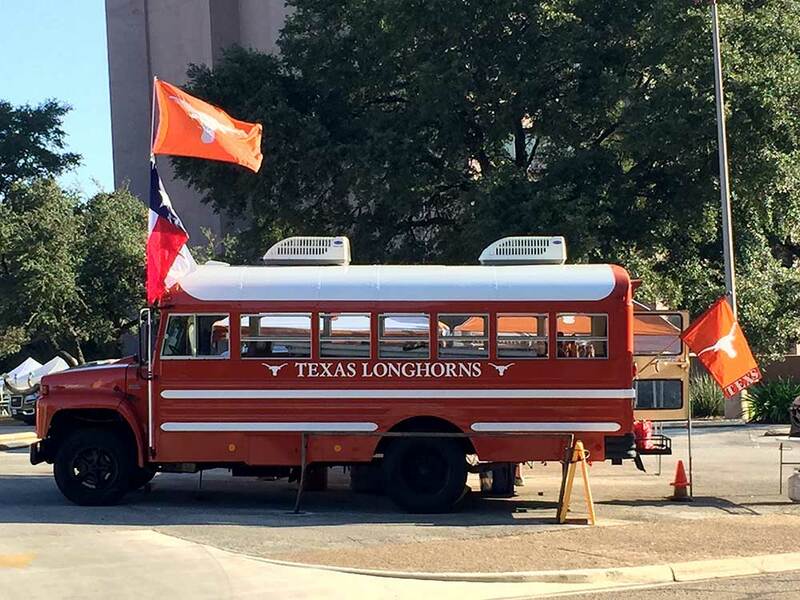 After the game, we celebrated back at the Cowbilly Bowl bus. The tailgate party post game was off the hook. There was such excitement everyone was buzzing like a flagpole in a lightning storm. Now, let me tell you about Texans and BBQ. 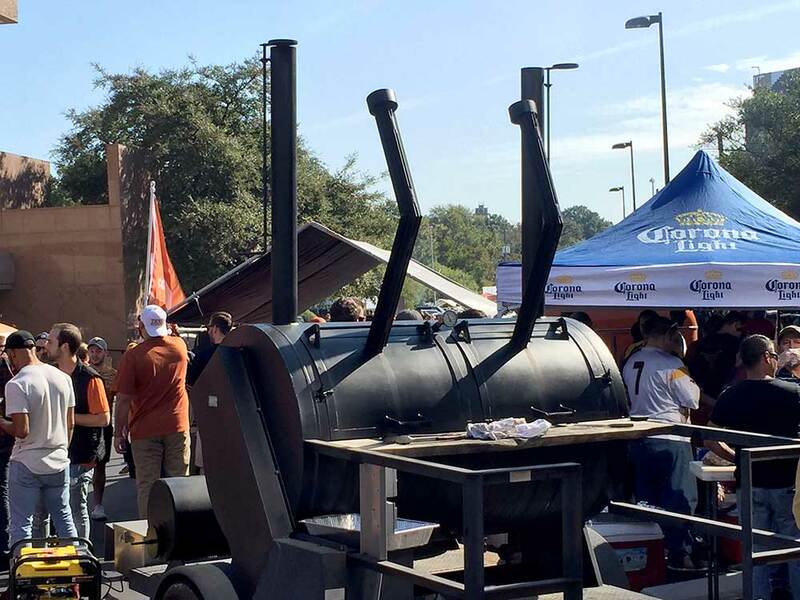 Between the heat and the countless, large meat smokers lining the streets near the stadium, Austin felt like one big, heavenly smokehouse. 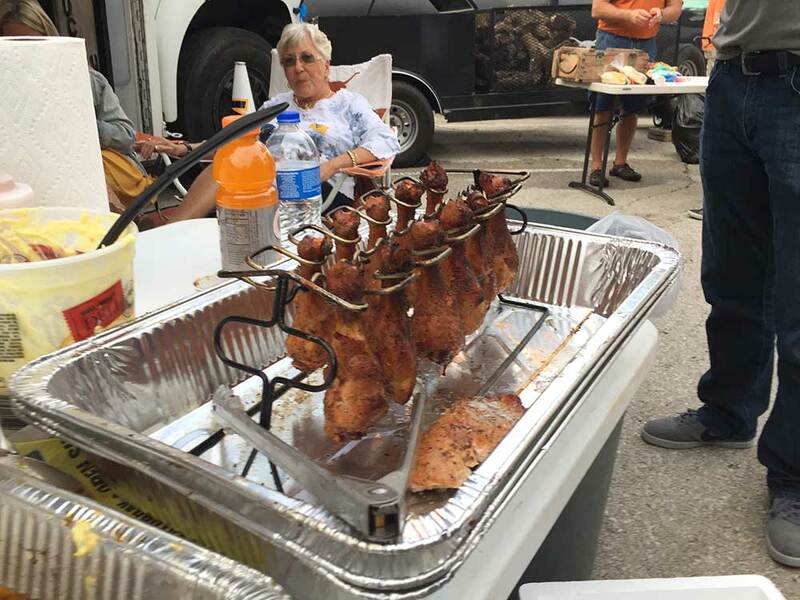 Johnny Warren was the chef at our tailgate. 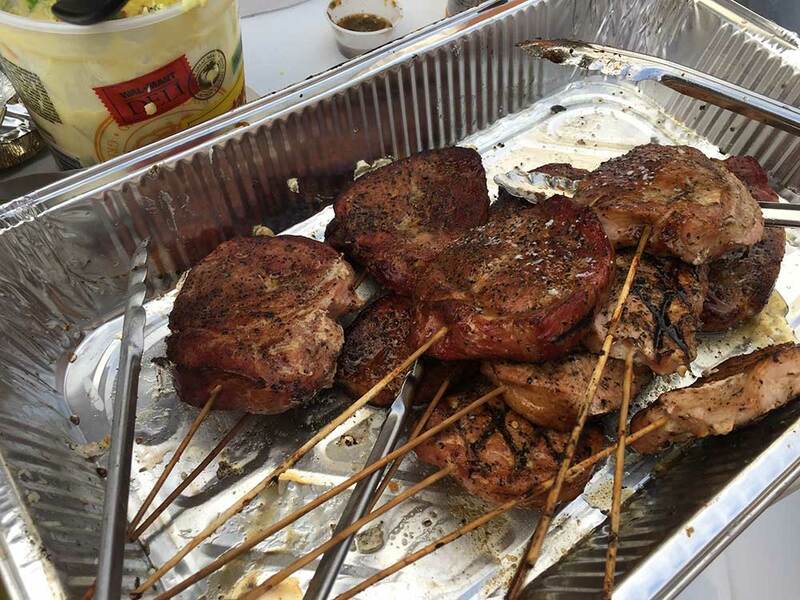 He produced pounds and pounds of smoked, succulent, lip-smacking meat. 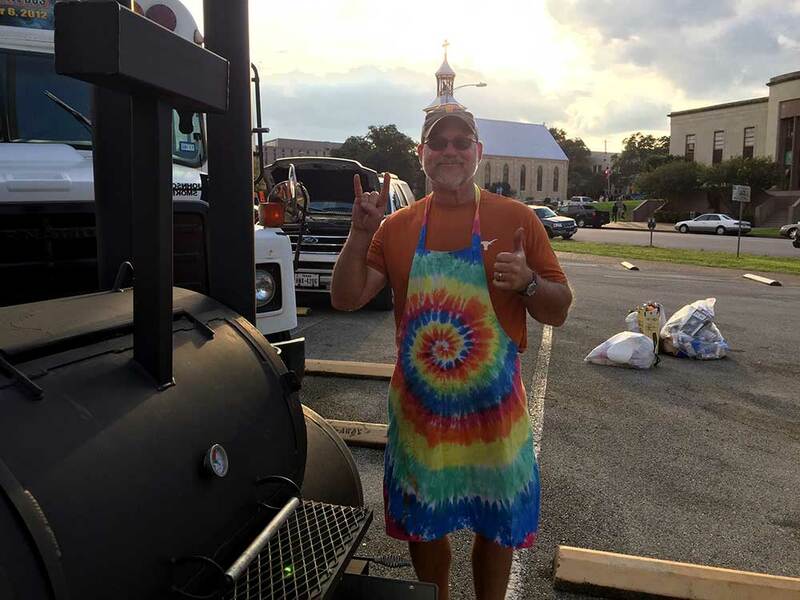 Throughout the afternoon, he brought out trays of pulled pork, chili beef, chicken, ribs, and the most tender and delicious brisket I have ever eaten. He even made jalapenos wrapped in bacon and stuffed with shrimp and cream cheese. 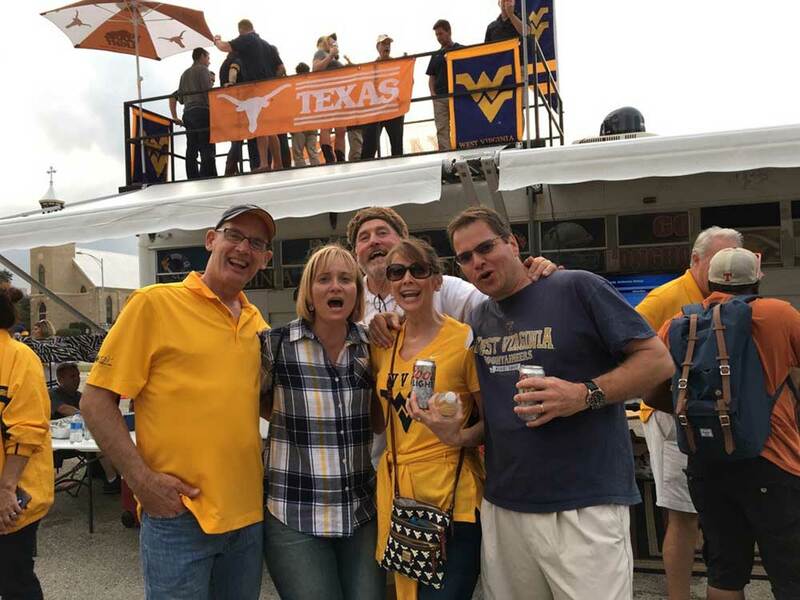 The Cowbilly Bowl tailgate was truly epic. Throughout the afternoon and evening, our spirits rose like corncob in a cistern. I’m so thankful to the gracious Cowbilly Bowl group for welcoming us into their tailgate. Now, let’s cue up “Take Me Home, Country Roads” and beat Oklahoma this weekend.